Today I met an artist who embarked on a daily project some time ago. Looking at her creations, I was fascinated. I thought about the many projects I've attempted, the many dreams I've had. I'd think about them, consider them, kneel down in the starting blocks and then just walk away. Many of my projects have never even got out of the starting blocks. Some faltered at the last hurdle. Some were badly managed and maintained and neglected and failed in the end. But today I met someone who does one thing each day. And has been for some time. This inspired me. To do a little something every day that is creative and that I enjoy ... How great is that? I've always wanted to write. I've always wanted to take great photos. So, this is a journey in words and photos. Some will be new, some will be taken from my archives. But they will all have meaning to me. Some of it will be gut wrenching agony, some lashing out in the extreme anger only hopelessness and loss can produce, some will be crumbling under the weight of introspection, a desperate attempt to make sense of all this madness, this insanity. But I hope that as I embark on this journey, there will also be healing. That I’ll be able to climb from this deep, dark, festering pit to a place up high from where I will have the most amazing mind expansive view and the lightness, the softness, the kindness I once so used to love. This photo was taken on 24 July 2008 in the South of France. It was the end of an unforgettable barge holiday and our last night on the barge. We moored at Le Ségala and I took this photo. I'm very fond of this photo. I consider it to be one of my best photo's taken to date. And that on a moving barge with no tripod. 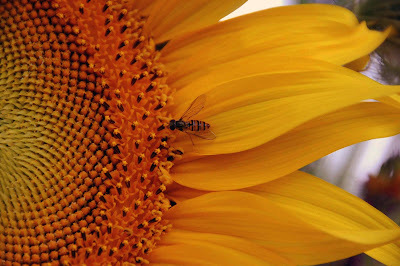 The inspiration for me is, like the tournesol, to keep facing the sun and like the bee, to keep busy, to collect nectar and to make the most delectable honey. A bit like the Miel de Forêt we had with cheese at the Michelin starred restaurant, Pascal Borrell, in Maury. Do you remember, dear?